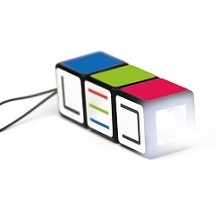 Our new Customised Rubiks Torches are the top of the line when it comes to Company brand-name exposure, and you just can't beat the puzzle orientated fun you get with these innovative rubiks cube torches! 70 hours of continuous battery life - and a super bright L.E.D bulb gives you a perfect opportunity to shed some light on your Company branding and logo, whilst gaining customers' retention and awareness. The twist-action provides a nifty business gift - one that will gain you a good reputation along the way..
For a FREE QUOTE, please fill in the form regarding our Customised Rubiks Torches and we'll be able to help you.